Tejon Pass is a mountain pass in southern California, which traverses the Grapevine Canyon. Tejon Summit is located on Interstate 5 approximately 70 miles north of Los Angeles, California. Tejon pass is often called the Grapevine, however, the Grapevine more correctly references the steep 5 1/2 mile grade section at the northern end of this pass. 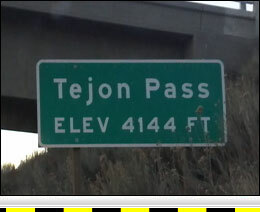 Northbound I-5 from Tejon Summit has a vertical descent of 2613 feet over 11.6 miles. The grade is steep for the first 2 to 3 miles then it lessens significantly before reaching the very steep grade section called the Grapevine Hill at 6.5 miles north of the summit. 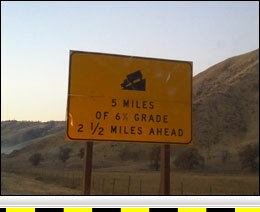 The reported grade for the Grapevine Hill is 6% for 5 miles. The Grapevine Hill has two runaway truck ramps. The first ramp is on the right, 3.3 miles from the top of the Grapevine Hill, and the second ramp is on the left at 3.6 miles from the top of the Grapevine Hill. Southbound I-5 from the Tejon Summit consists of approximately 22 miles of rolling hills before starting a steep descent down the "5-mile grade". The 5-mile grade has a vertical descent of 1603 feet over a total of 7.5 miles. 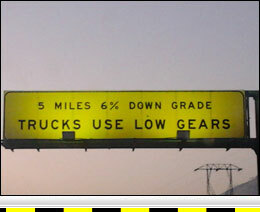 There is an uphill section just before reaching the 5-mile grade where there is a large brake check area for trucks. Runaway Ramps: One on the right side 9.5 miles from the summit. One on the left side 9.8 miles from the summit.